Living in a Prius for 4 months as a vandweller has its challenges and the biggest is you have to make serious choices of what you will bring with you and what you will leave behind, due to the obvious limitation of space. Some people are amazed what I have in my Prius and what I can do in it. Before this year I had 2 years of travels in my Prius under my belt. I had reworked so many things to meet my needs, and to be as effective as I could with space utilization. Part of space utilization is being able to get something when you need it with limited difficulty. So the things I use most often are most accessible. I learned this the first year. Everything, and I do mean everything, has to have a home. You would be surprised how you can forget where you put something. It was last summer (2016) that I was following a blogger/artist in Boston who posted about Havasu Falls hike into the Havasupi Reservation for a backcountry hike. I saw her beautiful pictures and wanted to experience it. With a mind that is young and my body that is getting older my attraction to doing this hike was strong, but I knew I needed to overcome physical limitations, as the mental desire alone would not get me through this difficult hike. I also knew I needed relatively light-weight hiking/camping equipment. Fast forward to packing my Prius in December 2016 and deciding what to bring, including what I may need for this wonderful backcountry hike. I didn't have everything I needed for backcountry, but had my list, as I had taken a class about hiking the Appalachian Trail that gave me lots of information. I brought what I could knowing that my square sleeping bag and square mattress pad that I sleep on for my Prius bed would not work for backpacking into the canyon. I would have to go out and buy a number of light weight things. Actually duplicates of items I already had. I decided not to buy anything until I knew I had a permit and was assured I was going. I started to worry about where all this extra stuff was going to go. My only undersigned space was the front drivers seat. I had in the past kept my extra shoes and a gallon jug of water and a bag of snacks and fruit there for easy access. When I wanted to bring someone with me I could move it to the backseat. It all conveniently fit in the floor well of the front passenger seat so I covered it with a dark item and when I stealthed it didn't draw attention that a seat piled high with stuff would. Well, I met up/teamed up with Joanne at the RTR for this hiking endeavor, and it was game on, after Joanne secured the permit before I did. I was then off to visit son and family in San Diego and you could find me most days in the San Diego REI researching what I wanted to buy without breaking the bank on spending. As one of the sales reps said to me one day, "the lighter the equipment, the lighter the wallet". How true is that!!!! My friend Ming, who I met at the RTR was coaching me from afar on light weight principles. I have mentioned my purchases for the trip in other blogs, but the first and foremost item that is needed was the backpack. The sales rep that day was Heavenly. Nice name and great personality. She described the packs and I studied each in copious detail. That engineering side of my brain to analyze everting from every aspect. I settled on a 50 ltr backpack, as I knew the size I wanted from talking to many people. Heavenly fitted the pack to my torso and it felt great. It turned out great during the hike too. OK, back to space utilization. 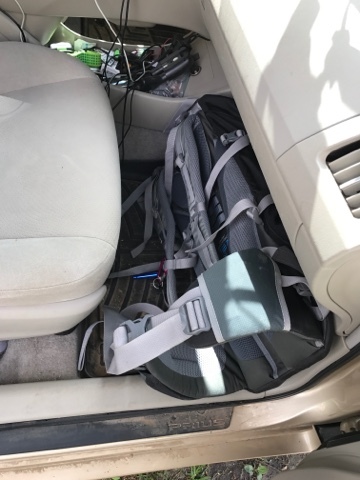 Check the photo above and this is the foot area for the front passenger with the backpack side to side with the back of the pack under the dash. There was still some space behind there for me to stash a couple pare of shoes. In the front of the pack I had room for my snack bag and a gallon of water. I was so happy with this arrangement. Now the news gets better. Another day I go back to the San Diego REI and find a discounted mummy sleeping bag that is just what I wanted for a great price. It stuffed it inside the backpack. As I did the light weight sleeping pad I got, and so on. The pack nearly fully loaded was laying on its side on the front passenger floor of my Prius. I still needed to get the dehydrated food that consumed space in a box and I dumped the box and found odd shaped spaces around the pack on the floor. When I wanted to take someone for a ride I had to move the backpack in total and just put it on my Prius bed. I was a happy vandweller from this experience as I expanded my abilities but not the car, and it shows you can do some amazing travels in the Prius and go backcountry camping too. I will cover the question that normally comes up when I talk about living in a small space and not having sufficient room for things. Why not put on a roof rack storage unit or a trailer hitch with rear storage? It has been my goal from my first day not to cop out and go large with the Prius. I'm an engineer and when I got my Prius it was my goal to put the functionality of my Class B Campervan into my Prius Vandwelling design, and I did. My goal was to not go outside the confines of the Prius skin to store things, and I did. I was challenged this year on how to store backcountry backpacking equipment, and I engineered a solution. The key was to find a backpack that did not have a hard frame. I needed the backpack to be comfortable on my back and 50 ltrs, but also I needed it to lay on the floor of the car side to side. I could not do this with a hard frame pack. Look at he picture above you can see how the waste belt encroaches on the door when it will close. It is this attention to detail that allows me to design and utilize space effectively. Great post. I hope to do the same one day. Havasu is on my bucket list for sure. Thank you for the information. It's been a bit of time since I checked your blog. Work keeps me busy. I had noticed your soft backpack and wondered what were the pros and cons. Thanks for sharing your travels and insights. I'm getting closer to camping. Bought a van but now will sell it and use the money to get a used Prius V. I will miss being able to stand up (only 5'5") and storing my 2 bicycles inside but fuel costs dictate hybrid. The soft backpack not only fit on the floor of the Prius, it fit wonderful on my back. The adjustment / fitting that I received at REI was just right. I carried the full pack down 2500 ft into Havasu Falls 10.5 miles and back out 2 days later. It rode perfectly on my hips. I can honestly say I forgot it was there and I didn’t have fatigue from the pack after the hike. The pockets and accesses into the bag allowed my hiking partner to get things out for me without taking pack off. The cons: there were none. I don’t do a lot of back country Hiking but never doubted my purchase and it’s going with me on future hikes. Best wishes with your Prius plans.